Sheriff’s deputies charged a Wilson County landlord in the death of a tenant she’s accused of pushing down the stairs nine months ago. 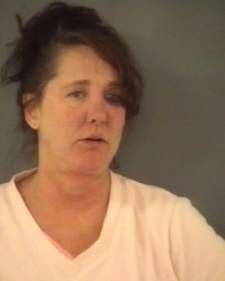 Mendy Morris Faires, 49, was arrested Tuesday on a charge of involuntary manslaughter. Deputies said Faires pushed 50-year-old Debra Wooten down the stairs of Wooten’s home at 5136 U.S. 301 N. in Elm City on Nov. 1. “Ever since November, she has been in Greenville in the hospital with complications from that fall,” said Wilson County Sheriff’s Office Chief of Staff Wanda Samuel. Wooten died on Aug. 9 after nine months of continuous medical treatment, Samuel said. The injuries she sustained in the fall didn’t appear to be life-threatening at first. In a field provided for deputies to describe the injury on the investigation report, Greene had checked the box marked “none,” the report shows. Other options provided included minor injury, loss of teeth, broken bones, severe cuts, internal, unconscious and other major injury. Faires was not charged with a crime after the preliminary investigation in November, according to the report. Wilson police arrested Faires on her fourth drunken-driving charge in late January after officers said she crashed her car into a ditch. She faced charges of habitual driving while impaired, possession of a non-tax-paid alcoholic beverage, driving while license revoked and exceeding a safe speed. A Wilson County grand jury indicted Faires on the habitual impaired driving charge on Aug. 5, and a hearing is set for Nov. 10 in Wilson County Superior Court. The remainder of the charges are pending in District Court. Faires’ listed address at the time of her January arrest was 9311 Winters Road outside Bailey. State prison system records shows that Faires has three DWI convictions in North Carolina, two from Mecklenburg County in 2001 and 2005 and one from Wilson County in December 2011. She also has a history of arrest and conviction on traffic charges and has had her driver’s license revoked multiple times. Involuntary manslaughter is punishable as a Class F felony, which carries a presumptive sentence of up to 13 to 16 months in prison or on intermediate punishment for a defendant with no criminal record. Voluntary manslaughter is the killing of another human being without malice, according to state statute. That offense is a Class D felony with an average sentence of 5 years, 4 months in prison.